CRDC was awarded a $1.8 million grant from the U.S. Environmental Protection Agency to capitalize a Brownfields Revolving Loan Fund (RLF). CRDC is providing loans and sub-grants to businesses, non-profits and municipalities to support clean-up activities of environmentally damaged (hazardous materials) sites that are suitable for redevelopment. Sites contaminated with petroleum based materials are not eligible. All sites must be pre-approved by the U.S. EPA prior to participation. Click here to read more about CRDC's Brownfields loans and grants. The Town of Hudson and Rockingham Economic Development Corporation (REDC) along with the EPA had requested that CRDC participate in the clean-up of a Hudson Brownfields site through a sub-grant of $200,000, to supplement the other funding from the EPA, provided earlier by REDC. The Town, in conjunction with the Zachary Tompkins Memorial Fund (ZMTF), intends to develop the site into a recreational complex, containing football and baseball fields, with an associated parking area and support facilities. Hudson town officals have been aware of the asbestos contamination since 1984. 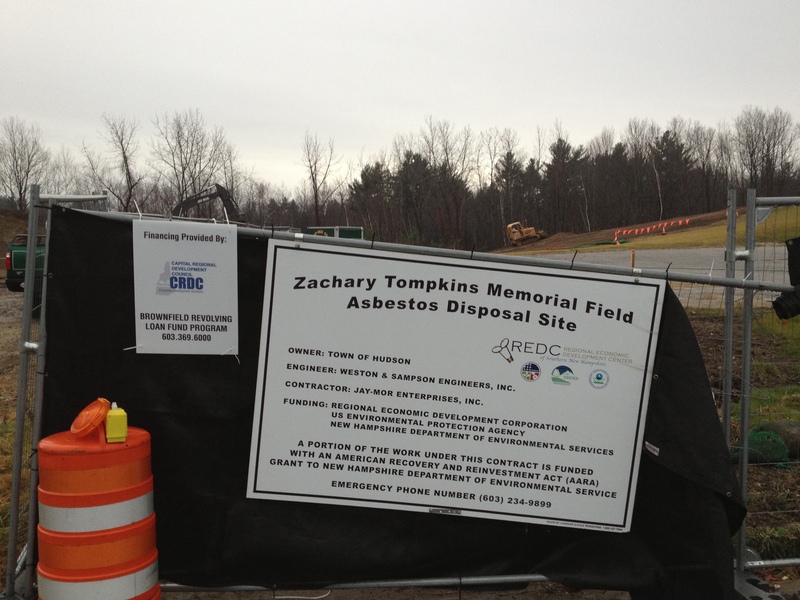 After the town acquired the property for non-payment of taxes, with an indemnification of the town, several studies have been completed to identify the extent of the asbestos contamination. A Remedial Action Plan (RAP) and the Analysis of Brownfield Cleanup Alternatives (ABCA) was prepared. These are key EPA requirements, as they focus on selecting the most appropriate remedial action to eliminate exposure to the asbestos contamination. The RAP was approved, based upon wholesale removal, relocation of the waste and capping. With the commencement of work, based upon evidence examined by the contractor and the supervising engineer, it became clear that the depth and the horizontal level of contamination was more extensive. "Because of safety concerns and winter conditions, CRDC's participation was both necessary and time-sensitive," said Stephen Heavener, CRDC Executive Director. CRDC awarded the $200,000 grant to Hudson and immediate work was done by the end of November 2013 to include mostly excavation and capping of the contaminated soil. The project was stabilized to the satisfaction of NH DES and EPA. This spring, Hudson officials say finishing work will be done related to the final ground cover, pavement and loam and seeding. In addition to Hudson, the City of Concord has been awarded sub-grants totaling $325,000 for the clean-up of three contiguous sites known as the Allied Leather Tannery and Amazon Realty, both on Canal Street in Penacook. In Keene, a $200,000 loan was deployed by CRDC to the Monadnock Economic Development Corporation to support clean-up of the site which is now home to the Monadnock Community Market Cooperative.